This is the most done tourism activity in the Virunga National Park Congo. There are six habituated gorilla families in the national park available for trekking. 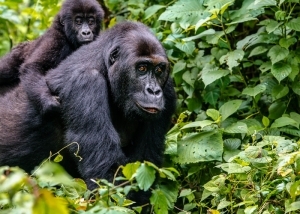 Virunga National Park is one of the four national parks in the whole world with the enduring mountain gorillas alongside the volcanoes national park in Rwanda, Bwindi impenetrable forest National park and Mgahinga gorilla national park both in Uganda. Kabirizi is the largest family in the national park with approximately 32 members including 10 babies, 4 sub adults, I black back, 11 adults, five juveniles and 1 silver back named kabirizi. The other gorilla families in the national park are Rugendo, Munyaga, Humba, Mapuwa and Lulengo families. A visit with a mountain gorilla family is a life varying experience. Mountain gorillas are highly intelligent, good natured, and fascinating to observe. The silverback’s powerful presence is awe-inspiring, yet his calm clearly earns him the title, “gentle giant”. People are equally struck by the tenderness and care that mothers show their young. And then, of course, there are the juveniles who spend most of every waking hour at play and never cease to make visitors smile. We believe your time with Virunga’s mountain gorillas will leave you feeling changed for the better. All treks are led by park rangers and usually depart from Bukima patrol post. 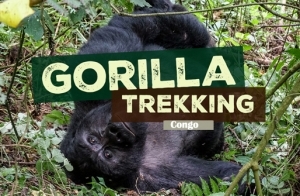 Treks usually require 1-2 hours of hiking in each direction, depending on where the mountain gorillas spent the previous night and the difficulty of the terrain. To safeguard the health of Virunga’s gorillas, visitors will be required to wear surgical masks (provided) when in the presence of gorillas. Children must be 15 years of age or older to go on a gorilla trek. Time with the gorillas is strictly limited to one hour. If you don’t feel well at the time of your scheduled trek (i.e. you have a cold, fever, diarrhea, or persistent sore throat) – please cancel. Mountain gorillas are extremely susceptible to human illnesses. Gorillas have died after being exposed to human respiratory viruses and other common ailments. Hiking to trek the gorillas needs someone to be fit and there is always a gorilla briefing that starts at 7:00 a.m. Gorilla tracking can take a varied length of time depending on the group that is tracking, sometimes the tracking can take 1 hour and minutes and others will take as long as 5hours. Why Should you visit DR Congo? Accommodation in Virunga National Park Congo? Copyright © 2019 virunganationalparkcongodrc | Powered by Prime Safaris & Tours Ltd.